Social Media isn’t just for personal use. It can be We’ve all been there before—do I use Facebook, Twitter, Google+, Pinterest, Instagram, YouTube or all of them? While the use of any social media channel is important, you don’t have to stress yourself out too much when it comes to choosing a network because anyone will do. However, I highly recommend beginning to create your online presence through Facebook, Twitter and Google+ because these three are the most versatile and well known ones. Let’s take a look at each social media channel and how to utilize each in the best ways possible. Facebook continues to be the reigning champ of all social media sites—it is the #1 spot where friends connect and share online, and you should too! When it first rolled out, Facebook was simply a meeting place for friends. However, Facebook has grown into a venue for businesses to market themselves through interaction with customers and self-promotion. Whether you are just starting out or your practice is well known, Facebook is a great way to develop your brand identity and show your human side. After all, you are more than just a dental office—you’re super heroes! I mean, we can be super heroes can’t we? Facebook is where you can loosen the tie a bit and don’t have to be afraid to be funny. Think about what your key audience would want to see. Share images, links, videos, anything, as long as it is connected with your business and something your target audience will enjoy. And, if you want, you can even create your own images or videos to share! Twitter was originally created for sharing short-burst thoughts, but it has grown into one of the three core social media platforms. For this reason, you need to pay attention to your tweets (I’m still getting the hang of this too, so don’t worry). Think about motivational, educational and inspiring posts—keep it in the realm of what your practice offers, though. When it comes to your practice and your Twitter, think about what makes you stand out and how you can reach your intended audience because a potential follower won’t waste time on your page if your tweets are not interesting. With over 302 million active users, Twitter is a platform you should not miss out on, so make your content interesting and fun so people will want to follow you and retweet you! Authorship – get your picture next to your listings in the search results. Relationship marketing – with Google hangouts you can connect to and get to know your followers (patients). Driving traffic – by building up your Google Plus profile, you can share content and news about your business. These are just the basics, but it can help you get started in making your practice known on social media! So, remember, don’t rule out social media—it isn’t just for personal use. 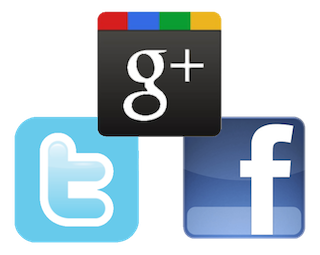 Take advantage of Facebook, Twitter and Google+ for your practice!